The setting couldn't be more magnificent. 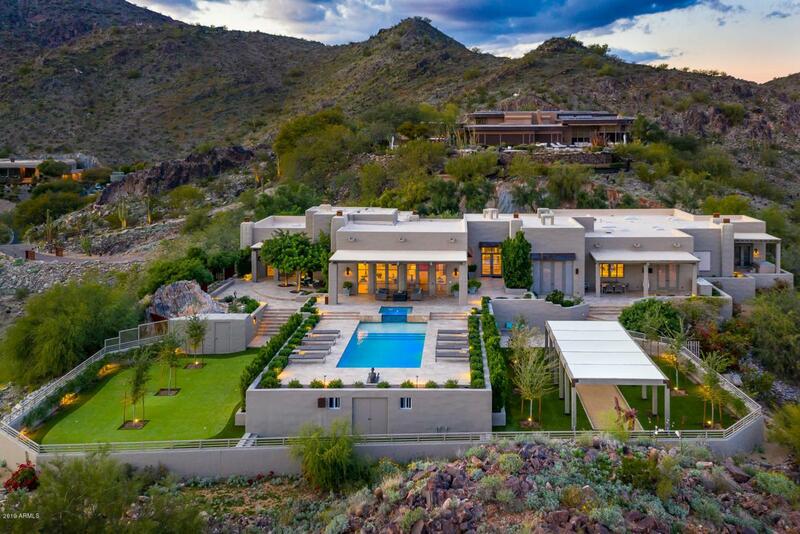 This completely remodeled (2016-2018) soft southwest contemporary sits on an elevated 2.08 acre gated site w/ views of Camelback, Mummy mountains & hills to the north & east valleys. It offers privacy rarely found on hilltop homes. Up a long, winding drive, & enter the gates into a large auto court w/ease of access. Enter through opaque glass front door into hand plastered walls, stone flooring, high ceilings, and in to brand new high-end finishes, fixtures & appliances throughout. Seven fireplaces. Kitchen has top of the line all new appliances, Viking, Sub-zero, two additional refrigerator drawers, Thermador microwave, Viking stove (conduction & gas), four farmer sinks & more. © 2019 Arizona Regional Multiple Listing Service, Inc. All rights reserved. All information should be verified by the recipient and none is guaranteed as accurate by ARMLS. The ARMLS logo indicates a property listed by a real estate brokerage other than Keller Williams Realty Phoenix. Data last updated 2019-04-20T22:11:01.67.